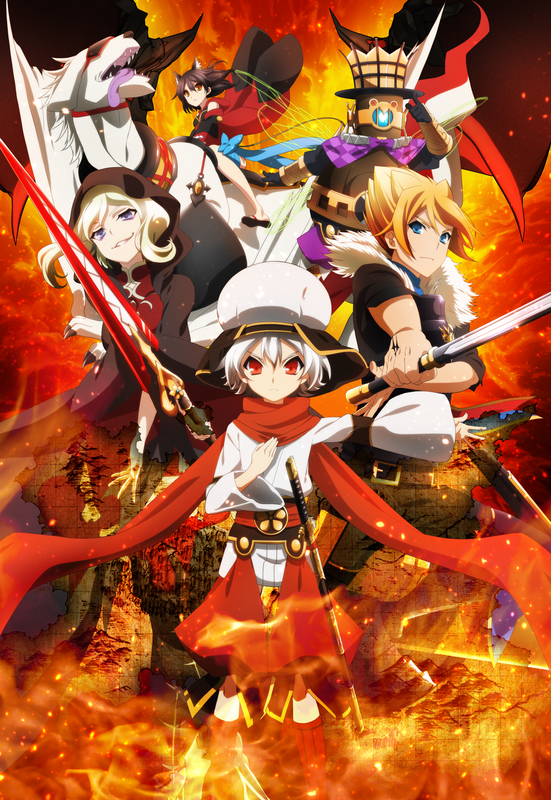 After an extended wait to find a subbed version, I finally have found access to Chaos Dragon – Sekiryuu Seneki. Which, at first, I must say didn’t feel like it was worth the wait. Granted, it has blood splatter, a seemingly insurmountable force, as well as charismatic villains, but with the Dragon in question looking like something out of Digimon, I felt myself losing interest. However, with a human sacrifice, I found my interest slightly renewed. But enough spoilers in the intro, for more on episode one “Kill One To Save Many” look below. Within the country of Nil Kamui lives a boy named Ibuki. He is the last of the Koutoushu, a legendary family which is neither human nor otherworldly, but something lost in the grey area in between. This child’s destiny was to be king, yet thanks to the people of Kouran waging a 7-year war, alongside former allies, the Donatian, leaving Nil Kamui to fend for itself, all but Ibuki have been killed. Now, it seems quite a few know Ibuki was to be king, but no one seems to take it seriously besides those who are part of the rebel army. Of which, right now only Eiha and Fugaku have been introduced. Fugaku, upon first appearance, you’d think was Ibuki’s teenaged older brother, since he seems to be the one who has protected Ibuki since the fall of Nil Kamui. In truth, though, likely they aren’t related, but it is likely safe to assume Fugaku, or perhaps his parents, were protectors of the royal family. As for Eiha? Well, all we know is she is known by the Kouran as “The Bound One” and that she rides a beast called Vaal. Outside of that, the only thing of interest when it comes to Eiha is her cat ears. Likely signifying that while she may not be on the level of the Koutoushu, she is of their ilk. After the aforementioned 7 year war, Kouran has since occupied Nil Kamui and it has been under its protection ever since. Thus leading to some moments when it honestly seems Kouran represents an almost sort of antagonist America vs. post-war Japan. Though that could just be me. Either way, in the post-war period the Nil Kamui people aren’t allowed weapons, especially swords, so upon the much hyped general Lady Koukaku  seeing Ibuki with a sword, that Fugaku told Ibuki to take with him outside, naturally he is stopped. Issue is, said sword is the dragon sword and pretty much is the last remnant of the Koutoushu legacy. Though, being that Ibuki rather submit than agitate, so that peace could be maintained, he offers up the sword to Koukaku. However, Koukaku didn’t want the sword itself, she wanted it thrown away. Something Ibuki didn’t do so it seemed she planned to strike him. However, not too long before that moment, Fugaku started an uprising. Something which led, thanks to Koukaku’s assumed second in command Kouretsu, a massacre. Of which the show pulled no stops with. A mother is killed while holding her child, and even the ever so sweet Mashiro, who seemed like a potential love interest for Ibuki, is slain. Albeit in such a way where it feels done to quickly pull on your heart strings, but being that her sweetness was so hard to not fall for, nonetheless it did have a bit of an impact on me. With Mashiro’s death, due to Kouretsu, the haunting Red Dragon, after many attempts earlier, finally is able to get Ibuki to commit to a pact with him. Issue is, like most pacts with a god, a sacrifice is required. Thus leading us to watch Mashiro awaken from what was thought to be her eternal slumber, only to die by being Ibuki’s sacrifice. It should be noted, though, Ibuki is conflicted about every bit of this along the way. First, he is conflicted for he knows Fugaku is the one which set all this in motion, then he is conflicted about the pact with the Red Dragon, but with the Red Dragon promising to grant him a wish, of which would have been to save Mashiro, that is truly what got him to commit. However, as noted, Mashiro had to be sacrificed and it was truly the power of the Red Dragon which led Ibuki to kill her, for with all his might he was trying to keep that blade from plunging into that child. Though with Mashiro glad to be a sacrifice for the greater good, and because the sacrifice has to be someone precious, thus making her being a sacrifice a compliment, so begins the Red Dragon’s pact and Ibuki’s quest to change the world, as well as revenge. Of which, Kouretsu is the first to die. : Lady Koukaku, like many a anime villain, is obviously eccentric. However, one thing worth noting is it seems she has a thing for young boys. Now, whether it is simply she loves the feeling of their cheeks, or perhaps it is something darker than that, it is too early to tell. Another king, who seemingly reps the Black Dragon, is within Nil Kamui. His name is Lord Soirot, and alongside side him is Meril. The Digimon comparison mostly stems from the Red Dragon reminding me of Guilmon in some ways, alongside Eiha’s monster Vaal also looking like something straight out of Digimon. Plus, in some ways, I fully expected Ibuki and the Red Dragon to merge as what happened in Digimon Frontier. Which is slightly the case, but when Ibuki defeats Kouretsu he doesn’t become a dragon, but simply funnels the Red Dragon’s power through his blade. I really tried to get into this series but just couldn’t. I don’t remember how many episodes I watched but it can’t have been more than 3 and I don’t think I remembered anyone’s name or was really into the story enough to even really care what they were trying to do at that point. It is one of those anime on my long list of anime to revisit one day and maybe I’ll have a different impression but at the time I just wasn’t feeling this.